There is no other trip that sees as much of the “wealth” that the Commonwealth of Virginia offers! After check-in Sunday at camp playing, packing and preparing, we’ll travel Monday morning to hike a mountain peak for unique "mountain-top" group games and devotions and putting our toes into the mountain stream. Then it's eastward to put our toes (and, let's be honest, usually our entire bodies) in the Atlantic Ocean for sunset swimming. After an overnight stay at our hotel or hostel, Tuesday morning is beach day at a natural section of Sandbridge Beach (south of Virginia Beach) for a fun-filled day of sand and swimming. Tuesday evening includes a visit to the fun and bustling shops and shows along the Virginia Beach Boardwalk, then overnight at our hotel/hostel. Wednesday after "Morning Watch" sunrise over the Atlantic Ocean, we’ll travel across the Chesapeake Bay Bridge-Tunnel to VA’s Eastern Shore and our partner site, Camp Occohannock on the Bay for canoeing, kayaking and fishing, watching a brilliant sunset in the Bay, all while enjoying Camp OOTB's hospitality, program, good food and unique tidal marsh at Occohannock Creek (including July 4 fireworks!). Thursday, we’ll visit Assateague Nat’l Seashore for another fun beach day plus exploring to see wild ponies of Assateague and the famous ice cream and shops of Chincoteague. This fun, intense adventure trip is suitable for beginners or experienced campers, and it’s the trip all the adventure staff want to lead. A trip-specific pack list will follow your sign up. Rated easy-moderate. Prerequisite: Must be able to swim. ​Subsidized Fee (discounted cost) = $510; Supporters Fee (actual cost) = $560; Sustainers Fee (actual cost + $50 gift) = $610. 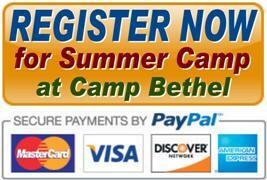 ​Why 3 Prices for Summer Camp? The Choice is Yours! Cancellations, Late Arrivals, Early Departure: Please notify the camp office 540-992-2940 or CampBethelOffice@gmail.com in advance if your camper will not attend this session. Campers are expected to attend this camp in its entirety. Late arrival and early departure is discouraged, but allowed in case of illness, family emergency or conditions beyond control. (1) $50 of your deposit or payment is non-refundable unless Camp Bethel cancels the camp program. (2) A $20 processing fee must be added if you choose to switch or reschedule your camp date. (3) If complete payment of the camp fee (or scholarship approval or Good-As-Gold form) is not received 14 days prior to your camp date you will forfeit your reserved spot. (4) There are no refunds for cancellation of reserved spot in camp within 14 days prior to your camp date. (5) There are no refunds for partial camp attendance or early departure for any reason unless Camp Bethel cancels the camp program. Behavior Policy: We simply cannot tolerate misbehavior or refusal to participate in group activiites during this trip. By requesting enrollment into Camp Bethel programs, you have agreed to abide by our Behavior Policy. All campers, staff and guests at Camp Bethel are expected to behave in a manner conducive to Christian programming and appropriate to child and youth development. Behavior deemed dangerous, inappropriate, intolerable, detrimental to the group or unmanageable by the Camp Directors is grounds for dismissal from camp, (ex: fighting; possession of illegal or harmful item; constant misbehavior; unsafe behavior; etc). Parents will be called as needed. Should it become necessary for your child to return home because of unmanageable behavior, homesickness or other reason, you have agreed to accept the Director’s decision and arrange for transportation. Even if coming with a friend, you are expected to be friendly, courteous and helpful to others in the group. Actually, you HAVE to be! We simply cannot tolerate misbehavior or refusal to participate in group activities during this trip. This trip is co-ed. You should expect to share your group with youth of different backgrounds, gifts and abilities. We believe Jesus’ message of life, hope, love and unconditional acceptance, and at camp, “Love your neighbor” is part of daily living. If , due to behavior issues, you must pick up your child, because we are far away from camp, our only option is to that YOU travel to get your child. This may or may not be feasible until one or two days later.